WooCommerce is quite flexible in how it allows you to customize your products and product details. However, one feature that is missing is the ability to add additional options (which may or may not add to or subtract from the total price) to your products. A good example of a business that would require extra WooCommerce product options is a pizza take-away shop. 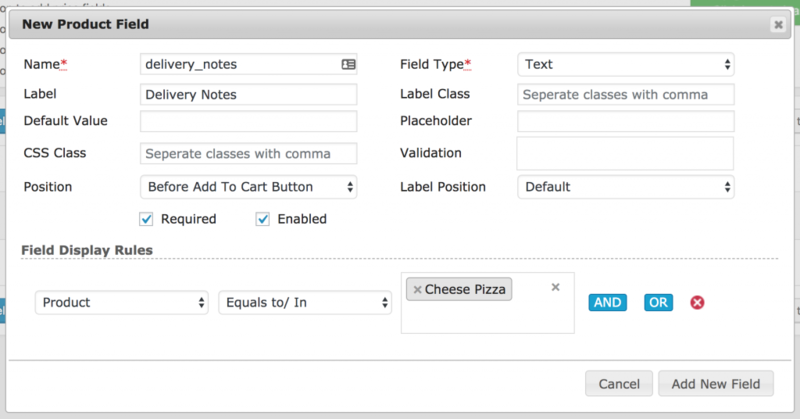 If you’re selling pizzas you would most likely want to allow your customers who order pizzas from your WooCommerce store, the ability to add or remove toppings. You may also want to provide an additional free form text field for delivery instructions. There are many other products and businesses that require extra WooCommerce product options, and if you fit in to that boat, you’re at the right place. In this guide we’re going to show you exactly how to add extra options to your WooCommerce products. As mentioned above, we unfortunately do not have the ability to be able to add extra options to WooCommerce products out of the box. We need to install a plugin to add this functionality. Here at WP Geeks, we’re in the process of building out an awesome extra product options plugin. You can read more about the progress of this plugin on our blog, but until it’s completed, we recommend that you install the Woo Extra Product Options plugin from the WordPress.org plugin repository. Once you’ve downloaded and installed the plugin, move on to the next step. What we need to do now is decide on what extra fields we want to add to our products? You can create as many different fields as you want, it all depends on how you configure your products. 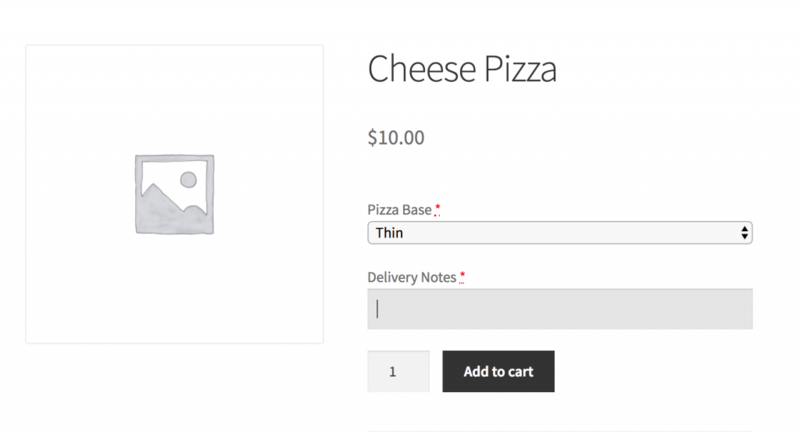 Continuing on with the pizza example above, in this guide we’re going to add two extra product options to a pizza product. 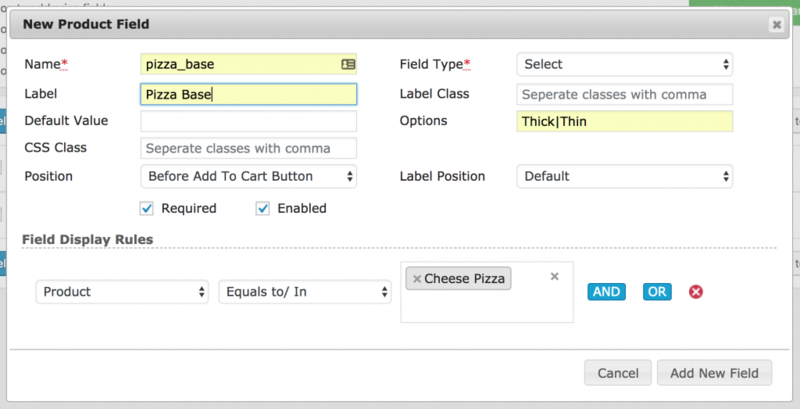 We’re going to let the customer decide what kind of base they want for their pizza and add an additional text field for any delivery instructions. We could expand this to include toppings, pizza sizes, add ons etc, but to keep this guide to the point, we’re just going to add the two extra fields as discussed. 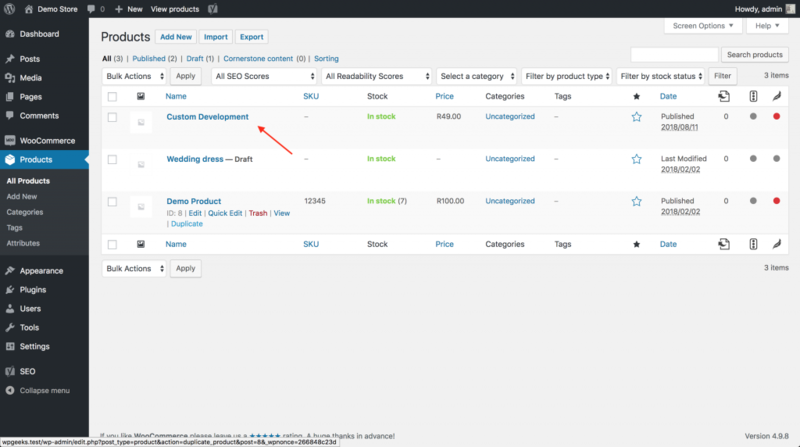 Navigate to “Products” on the WP Admin sidebar and click “Extra Product Option. From this page, we are able to add our product options. You should click on “Add field” to add a new option and then specify the parameters for the option. Notice how I’ve set up a conditional rule to add these options to my “Cheese Pizza”. This is an important step as it is how the extra options get added to your products. I’ve done the same for the delivery field as I did for the base selection, except I’ve selected a “Text” field instead of “Select” box. And lastly, here is what my additional fields that I have created look like. You can drag and drop your options to order them. Important note! Make sure you click “Save changes” after adding the fields, otherwise your changes will get lost when clicking away from the page. The last step to complete here is to verify that the product options did indeed get added to your product. Go to the product that you’ve added the extra WooCommerce product options to from the frontend of your website and you’ll immediately notice the extra fields. If you don’t something wen’t wrong. Refer back to the instructions in Step 2 to make sure you configured the extra options correctly. Here is what our Pizza example looks like. Lastly, what we’ve done above is very basic and does not include anything like price conditionals. You’re very likely going to want to change the price of your product based on the option you’ve selected. To add more advanced features like price conditionals, you will need to purchase the premium plugin. Once unlocked, you’ll have the ability to customize the rules however you need to based on your use case. We really hope that you found this guide useful! Do let us know if you have any questions or comments down below. 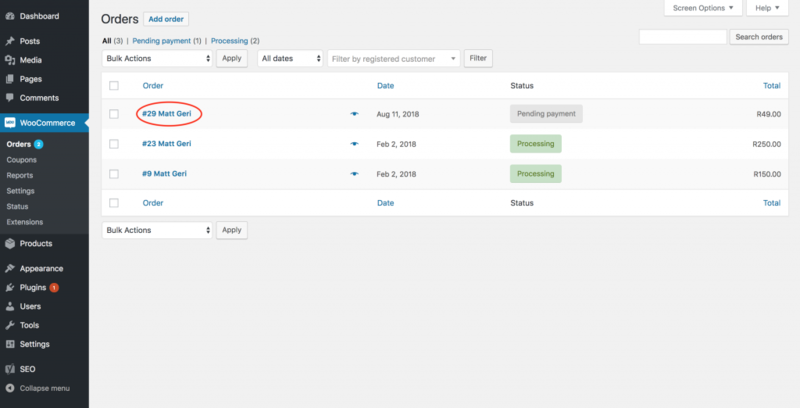 In a previous version of WooCommerce, you had the ability to be able to pay for an “over the phone order” on behalf of a customer, by clicking the payment link on the order and typing in the user’s credit card details. This was a really important feature to a number of businesses, especially businesses who take orders over the phone. Unfortunately, the ability to pay for a WooCommerce order is no longer possible. The customers have to pay for the orders themselves. Unless, of course you use the trick that we’re going to outline in this guide. It unfortunately involves a bit of trickery, but the good news is that here at WP Geeks, we’re busy working on a plugin that will allow you to pay for orders without any hassle. That’ll be ready soon, but until then, use the method below. Firstly, locate the order that you would like to pay on behalf of the customer. Do this by hovering over the “WooCommerce” tab on the WP Admin sidebar and clicking “Orders”. Scroll through the list, or use the search until you find the order that you need to pay. Click on the order title to go through to the order page. See the screenshot below for an example of what to click. Now that you’re on the order page, we need to update the order so that WooCommerce thinks that it has been purchased by a guest. This is so that you can avoid having to log in as the customer to make the payment. Under the order details, there is a drop down select box for “Customer”. You’ll see the customer in the select box with a little “x” next to their name on the right hand side. Click that to remove the customer for the order and assign it as a “Guest” order. Be sure to save the order for the changes to persist. Important note! Make sure you remember who made the order in the first place. It’s a good idea here to write down the order number and customer email address to make sure you can reassign the order to the customer in Step 4. See below for the select box which you should use to change the order to “Guest”. Now, because you’re logged in to WooCommerce, you won’t be able to pay for a Guest or Customer order. You either need to log out, or do what we prefer, open the payment for the order in a new incognito window in Google Chrome or private window in Safari. If you don’t know what incognito/private browser windows are, they are basically a new temporary browser window where you act as a completely new internet browser. All your logged in sessions are not carried through to this window and the browser will not track browsing history in this window. It’s perfect for being able to pay for a WooCommerce order assigned to a guest because you will not be logged in to your store when you open it. Right click the payment link under your order details, and click (for Chrome users) open in new incognito window. Check out this screenshot for an example. You can now actually pay for the order. Select your payment method (this would usually be a credit card) and type in the details of the customers payment method to pay. Now that the order is paid for, don’t forget to reallocate that order to the customer who actually made it in the first place. We don’t want the order hanging under the Guest account. This is important for tracking purposes and the ability to re-market to your customers. You can do this by doing the same thing that we did in step 2. Go to the “Customer” drop down box on the order and start typing the name of the customer. Click their name when they come up in the search and save the order. There we go, that is all there is to it! 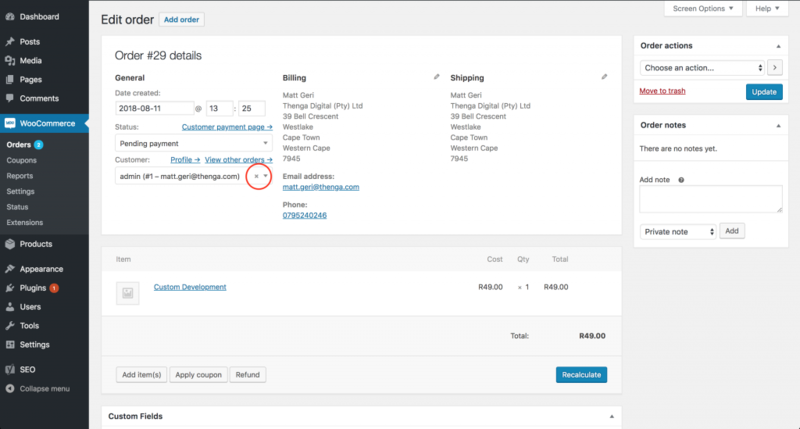 You can now pay for a WooCommerce order on behalf of your customers. We hope you found this guide useful. Let us know in the comments if you have any questions. Sometimes, there are certain people you just don’t want buying products on your WooCommerce store. But how do you stop them? One of the easiest was is to restrict WooCommerce registrations. The problem is that you can’t restrict user registrations out of the box with WooCommerce. Don’t despair! We’ve got the solution for you. Firstly, let’s go ahead and install a plugin to add this functionality to WordPress/WooCommerce. Here at WP Geeks, we’re actually in the process of building out our own custom WooCommerce registration restriction plugin. It’ll only be ready towards the end of the year though. So in the meantime, we recommend that you install Restrict User Registrations from the WordPress plugin repository. Go ahead and install it and once it’s been added to your store, move on to the next step. Restrict specific usernames from being used. This is generally done if you want to reserve a username for a particular customer or future purpose. Restrict specific email addresses. This is where is gets more personal. If you want to stop a specific customer or person from registering and buying from your store, you can add their email to this section. Restrict email service providers. 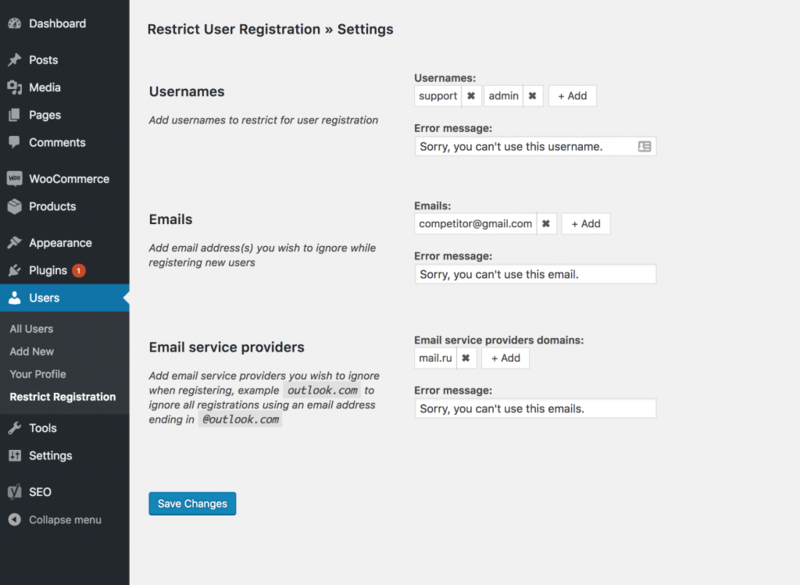 Lastly, you’re able to restrict registrations based on the email provider they use. An example would be restricting anyone who uses a Yahoo email account. Once you’ve decided how you would like to apply your restrictions, go ahead and add them and save the settings. Here is what some example restrictions on our demo store look like. Now that your restrictions are in place, it’s a good idea to go ahead and verify that they’re working. This will validate that nothing was configured incorrectly or left out. To test, simply attempt to create a customer account with a banned username or email address. It should not allow the registration to go through. We really hope that you found this guide on how to restrict WooCommerce registrations useful. If you have any questions, be sure to reach out in the comments below and we’ll do our best to assist you. Whatever the reason for you wanting to implement WooCommerce role based pricing, this guide, will show you exactly how to get it setup on your website. As discussed earlier, we firstly need to install a plugin that enables role based pricing. There are a number of solutions for you to choose. Here at WP Geeks we’re actually in the process of building out our own solution. That’s not quite ready yet, and in the mean time, we recommend that you use this WooCommerce role based pricing plugin from the WordPress plugin repository. Go ahead and install it to your WordPress/WooCommerce website. Once it’s installed, come back to this page and move on to step 2. What products do you want to apply role pricing to? All of them? A specific subset? Which user roles should have adjusted pricing? By how much should you adjust the prices for each selected role? Make these decisions, and move on to step 3 when you’re done. Now that the plugin is installed and our strategy decided upon, let’s do some quick configuration. 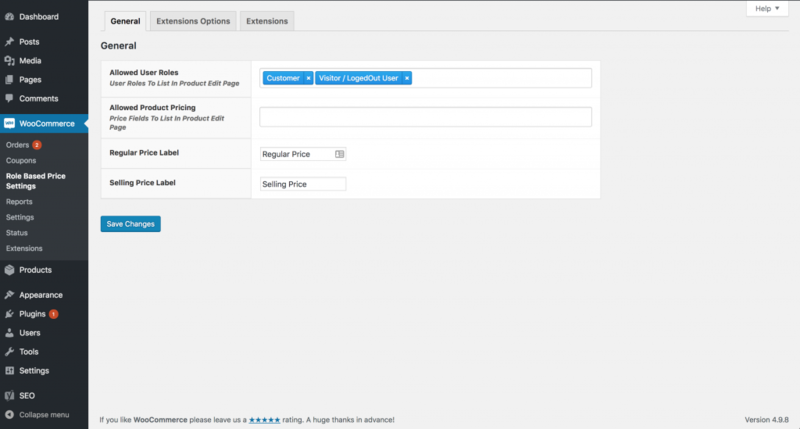 First, under the WooCommerce menu on the WP Admin sidebar, click “Role Based Price Settings”. From this page, you should define which user roles you would like to make available to set specific prices for and you are also able to adjust the labels for the pricing fields. Here is what the configuration looks like on our demo store. Firstly, find the product (or products) that you would like to apply your special pricing to. Unfortunately, you’re going to have to adjust the pricing to one product at a time. There is currently no setting to modify role based pricing in bulk. So you will need to repeat steps 4-5 for each product you pick. Click “Products” on the left hand side sidebar in WP Admin. Now select the product you’d like to apply the pricing to and click through to the edit page. Here’s what the product listing page looks like. Step 5: Configure the product prices for each role. On the product page, scroll down to the “WC Role Base Price Editor” meta box which should be under the “Product data” meta box. You’ll notice a list of user roles (select in step 3) and the ability to customize the price for each role. Firstly, click “Enable Role Based Pricing” and then start adding the prices in for each role. This is what the meta box should look like. One that’s done, save and move on to the next product (if you’re applying this to multiple products). And that’s all that there is to it. We really hope that you found the step by step guide to WooCommerce role based pricing useful. Let us know if you have any questions or comments down below. If you’re a developer, you may also be interested in our snippet which allows you to set customer specific pricing. Do you need to discontinue a WooCommerce product from your store? If so, I’m sure that by now you’ve realized that WooCommerce doesn’t have a built in way to do this. The good news however is that there are plugins which allow you to create a WooCommerce discontinued product. In this step by step guide, we’re going to show you exactly how to add the functionality to WooCommerce so that you can start discontinuing products from your store today. Before we actually install a plugin, there is a chance you may not even need a plugin at all. If you want to hide the product completely from the front end of your website so that no one will ever be able to find it again, then you actually just need to set your WooCommerce product to private. Retain the search engine rankings for the product page. If you rank well in the search engines for specific keywords on one of your products, you would not want to lose those rankings by removing the product. Allow customers to pre-order the product. You may be anticipating that you’ll be receiving stock of the product at some point in the future and want to still take orders for the product. Allow customers to add the product to a wish list. Similar to the above, except you don’t take an order, you may want to just allow customers to add the product to a wish list and gather insights on interest in the product. If you decide to discontinue the product, rather than hide it, then keep on reading. Otherwise, you should have everything you need already to hide products using the previously linked guide. Ok, so we’ve decided to discontinue. Let’s install a plugin to get this functionality added. WP Geeks is in the process of building out our own WooCommerce discontinued products plugin, but until that is ready, we recommend that you use this plugin (WooCommerce Discontinued Product) to discontinue products. Download and install the plugin and then move to step 3. Now that you’re ready to discontinue a product, you need to find it. Go to “Products” on the right hand side menu and select the product from the list. You can also select the “Edit” button when hovering over the product. See the screenshot below for a reference of what to look for. Lastly, we need to actually discontinue the product itself. From the product page, scroll down to the “Product data” section. Then click “Discontinued Products” on the left hand side. From this tab, you’re able to set the product as discontinued. You can also adjust whether or not to show the product in the front end of the site, add a custom message and assign an alternative product. And that’s it. We hope you found this guide useful. If you need any assistance, send us a message in the comments below and we’ll do our best to help you out! Believe it or not, WooCommerce does not support UPC product numbers out of the box! There have been many calls from users of WooCommerce to get this feature added, but it has still not landed in the software just yet. So to add a WooCommerce UPC product number, you will need to use a plugin. Luckily, there are a number of plugins which add this functionality and in this guide we’re going to show you exactly how to get it setup on your site. Let’s go! Firstly, we’re going to install a plugin as discussed above. At WP Geeks, we’re currently working on a very simple and intuitive plugin for just this purpose, but until that is released, we recommend that you use the plugin built by Scott Bolinger. Download the plugin and install it to your WordPress and WooCommerce store. Done? Great, let’s move on. Now that the plugin is installed, we need to find the product that you want to add the UPC product number to. You’re very likely going to want to add a unique product number to multiple different products in your online store. Whatever the case, let’s find the first product to add the number to from the Products tab on the WP Admin sidebar menu. Once you’ve identified the product, click the edit button to edit the product. See the below screenshot to see where to find the edit button in the product listings. You can also click the product title. Lastly, we now simply need to scroll down to the Product data meta box on the product page. Click “Inventory” and you will see a field called GTIN (which stands for Global Trade Item Number). You should add the UPC code in to this field. See the screenshot below for what this field should look like. And that’s all there is to it! Did you get stuck or have any questions, hit us up in the comments below. We’ll do our best to help you out. Do you need to be able to accept WooCommerce deposits or partial payments on your online store? Yes? Good! You’re at the right place. In this in-depth guide we’re going to show you exactly how to accept WooCommerce deposits on your website. Unfortunately, accepting deposits is not default WooCommerce functionality. That means that we’re going to need to install a plugin to be able to do this. Don’t stress though, there are a couple of plugins to choose from and we’ll guide you to the right plugin for you! In this guide, we’re going to use the WooCommerce Deposits plugin from WooCommerce. This is our current recommendation for a partial payment/deposit plugin. The steps that follow in this guide will be applicable to any of the above plugins, so don’t worry if you decide to go with another plugin. Install the plugin of your choice and then move on to the next step. Apply the deposit setting per product. This makes sense if you only want to allow certain products on your store to accept pre-payments or deposits on. Apply the deposit setting globally. This means that when a user is checking out, they will have the ability to pay a deposit on all the items in their cart, not just a specific product. You should know, based on your business model, which of the above options to implement. If you’ve decided on Option 2 in step 2, then you need to apply the deposit globally. 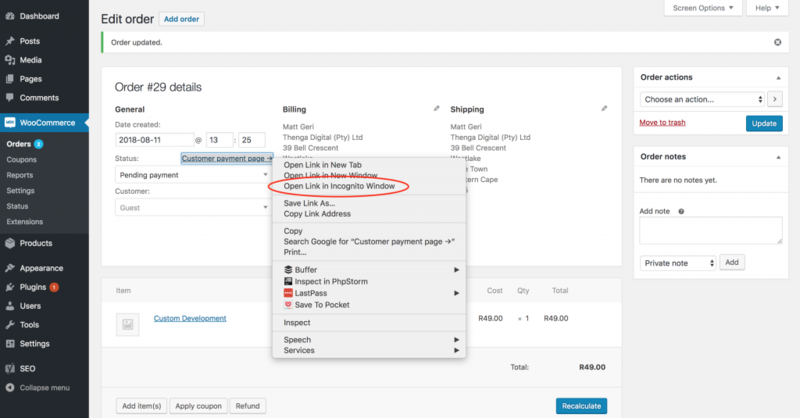 You can do this by navigating to WooCommerce > Settings > Products >Deposits and adjusting the settings to your needs. If you need to apply the deposit per product, then you need to adjust the settings on a individual product level. To do this, find the individual product from the Products menu on the sidebar. Select the product you would like to apply the deposit to, and adjust the settings in the Product meta data box. We hope this guide was helpful to you. As always, if you have any specific questions, do feel free to reach out in the comment below and we will try our best to help you out. Don’t despair though! There are a number of solutions available for you to choose from. In this guide we’re going to look at them and how to set them up on your own store. To start off with, we naturally need to install a bulk discount plugin. This is where you will need to make a choice as to which plugin you would like to use. We’re actually developing our own in-house plugin for WooCommerce bulk discounts, but for now you’ll have to use another developers plugin. For simplicities sake, in this guide we’re going to be using the WooCommerce Bulk Discounts plugin plugin from the WordPress plugin repository. The steps that follow will be applicable to any plugin that you use, so feel free to pick another plugin if you prefer. Now that you’ve picked your plugin, install it to your WooCommerce store and move on to the next step. At this point, we need to make a decision around how to implement bulk pricing. How many units should be purchased for the bulk pricing to kick in? Should the special pricing only apply to certain products or all the products on the site? This is a good time to review your discount strategy. Make the decisions before moving on to the next step. Think about these discount types very carefully as they have very different effects on the final price that you offer your customer. Once you’re happy with the type of discount you want to apply, let’s actually set them up on your store. You’ve now got the plugin installed and the discount strategy in place, let’s do the actual plugin setup. 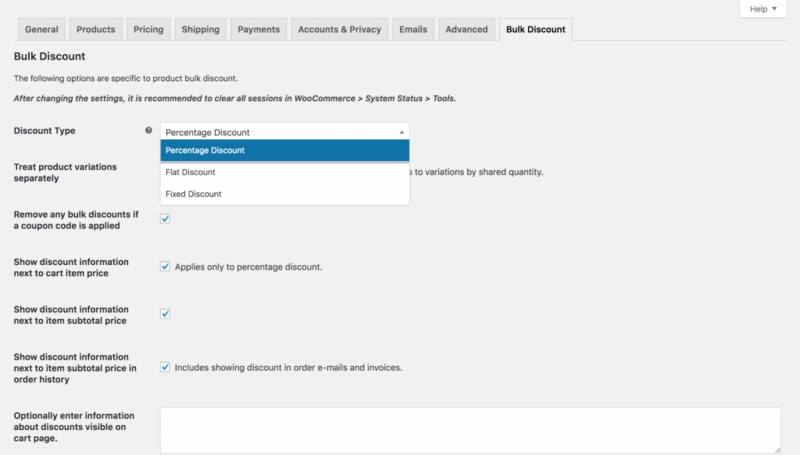 Using the WooCommerce Bulk Discounts plugin, go to your WooCommerce settings page and select “Bulk Discount”. From this settings page, setup the discounting type as discussed in step 3. Here is a screenshot of what this should look like. Now, let’s actually setup the discounts. To do this, find the product that you would like to apply a bulk discount to. 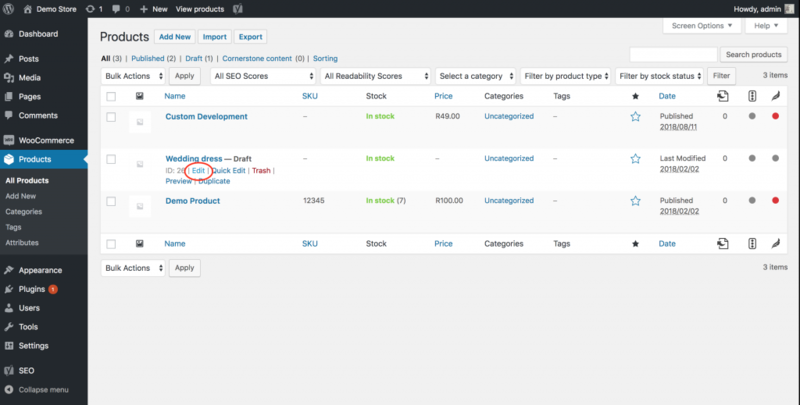 Go to Products on the WordPress sidebar and choose the product to edit. Add the discount that would would like to provide and don’t forget to update the Product after setting up the discount. You’ve now successfully setup bulk discounting based on quantity on your WooCommerce store. Congratulations! Do you still have questions? Maybe something didn’t work out as you expected it to? Leave us a comment below and we’ll try help out as best we can! 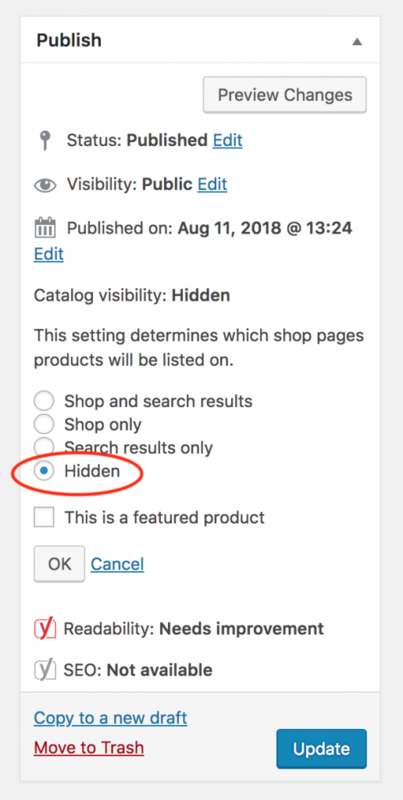 Do you need to hide a WooCommerce product from your store visitors? Great! You’re at the right place. In this detailed guide we’re going to show you exactly how to do that. To start off, we’ll cover how to hide a single WooCommerce product from the front end using the built in WooCommerce and WordPress functionality. Yep, that’s right, you won’t even need to install a plugin for this. We’ll later go in to some advanced use cases that you may need to cater for. Log in to WooCommerce and select the product that you would like to hide from the site. Once you’ve found it, click on the Product title and go to the edit page. Now, on the right hand side of the page, you’ll see the familiar “Publish” meta box which allows you to set publishing options and actually publish your post/product/page. You’ll see an option there called “Catalog visibility”. Click the “Edit” link next to it, and you’ll be presented with a list of options for the visibility of the Product on the front end. Naturally, you’ll want to select “Hidden” here. All that is left to do now, is to click the “Update” button and the product will completely disappear from the front end of your website. You will still be able to add it to an order inside the WP Admin area. The above mostly just covers the basics of hiding a single product from your WooCommerce store. However, what if you need to hide a product based on a category, tag or some other filter? We’ll soon be adding detailed instructions on how to do this using a custom plugin that we’re building. Hit us up in the comments below if you have any questions or feature requests for this plugin.